White House Briefly Evacuated After Man Jumps Fence, Makes It Inside The 42-year-old got past the front doors Friday night before the Secret Service arrested him. President Obama and his family weren't home at the time. 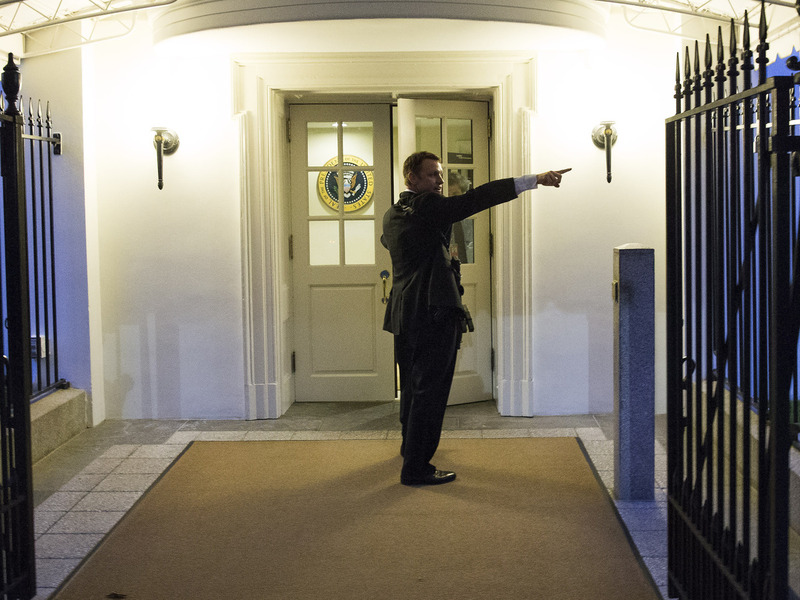 A Secret Service agent gives directions during an evacuation from the White House minutes after President Barack Obama departed for Camp David aboard Marine One on Friday in Washington. The U.S. Secret Service says a man who jumped over the White House fence made it just past the front doors before being apprehended. Secret Service spokesman Ed Donovan says a 42-year-old man jumped the North Fence and ran toward the White House, but appeared to officers to be unarmed. He was apprehended just inside the North Portico doors of the presidential residence. President Barack Obama and his family were not at home at the time of the incident. Donovan says the man is under arrest and was transported to a Washington hospital because he complained of chest pain. The incident prompted a rare evacuation of much of the White House.